The first width variable sea-going yacht in the world goes into serial production. The first ship in the series will be the 14,96 metre long Futura 49. It will be the first serial yacht on the market that unites deep sea-worthiness with an especially economical moorage use. The yacht’s patented slide-in mechanism makes it possible to transform the Futura from a width of 8 meters to a slim 4,80 meter harbor and inland canal width and back again with a push of a button. The Futura combines all the advantages of existing vessel types on the market (monohull and fixed multihull) in one yacht. "The POLAR Yacht Manufactory is the ideal partner for us," explains Gerhard Euchenhofer, CEO of Futura Yacht Systems, "the shipyard specializes in high quality production and uses modern materials, which means that the Futura’s serial production can produce a large number with high quality standards." The partnership is a win-win situation for each company and both are convinced of the Futura‘s success. "We offer sailors completely new opportunities for use in addition to more comfort and safety," adds Uli Bullmer, CFO of Futura Yacht Systems and sums up the catamaran‘s unique selling points. "The living quarters are barrier free and the crew can reside on the Futura completely on one level without stairs or companionway and the hulls can be slid under the central gondola. 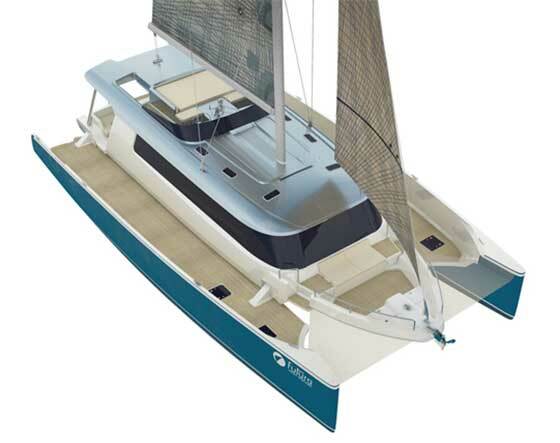 Safety, superior velocity potential, an upright position, and comfort of a catamaran with the practicality of a mono hull in the harbor are combined for the first time in a single yacht – sea views for all." An additional special feature is that the yacht can be tailored "Plug & Play" to respective needs of charters, owners, or operators without modifying the structure. Each FUTURA Yacht consists of three components: hulls – living gondola – shifting mechanisms. The hulls and living quarters each function as structurally independent modules. The shifting mechanism establishes the connection. 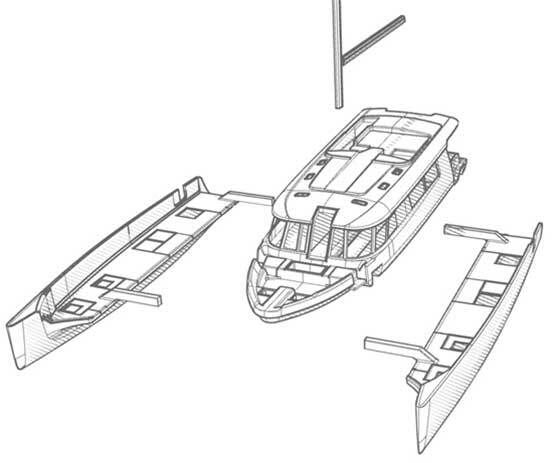 The modules can be replaced independently from each other and enables the Futura to be utilized as a Loft, or 1,2,3,4 cabin versions, as a sailing catamaran, yacht, trawler, harbor taxi, passenger ship, or event yacht for decades of use. The first yacht of the Futura 49 series will be completed next year. Production is forging ahead: the shipyard has already begun the mold construction based on the concept by Judel/Vrolijk and engineering by the Hamburg-based iYacht. In August/September 2016 the first yacht will leave the shipyard and can be seen at trade fairs.